He was in the third-grade class I taught at Saint Mary’s School in Morris, Minnesota. All thirty-four students were dear to me, but Mark Eklund was one in a million. Very neat in appearance, he had that happy-to-be-alive attitude that made even his occasional mischievousness delightful. Mark talked incessantly. I had to remind him again and again that talking with out permission was not acceptable. What impressed me so much, though, was his sincere response every time I had to correct him for misbehaving. “Thank you for correcting me, Sister!” I didn’t know what to make of it at first, but before long, I became accustomed to hearing it many times a day. That Saturday , I wrote down the name of each student on a separate sheet of paper, and listed what everyone else had said about that individual. On Monday I gave each student his or her list. Before long, the entire class was smiling. “Really?” I heard whispered. “I never knew that meant anything to any one!” “I didn’t know others liked me so much,” No one ever mentioned those papers in class again. I never knew if they discussed them after class or with their parents, but it didn’t matter. The exercise had accomplished its purpose. The students were happy with themselves and one another again. My father cleared his throat as he usually did before something important. “The Edlunds called last night,” he began. “Really?” I said. “I haven’t heard from them in years, I wonder how Mark is.” Dad responded quietly. “Mark was killed in Vietnam. The funeral is tomorrow, and his parents would like it if you could attend.” To this day, I can still point to the exact spot on I-494 where Dad told me about Mark. The church was packed wit Mark’s friends. Chuck’s sister sang “The Battle Hymn of the Republic,” Why did it have to rain on the day of the funeral? It was difficult enough at the graveside. The pastor said the usual prayers, and the bugler played “Taps.” One by one, those who loved Mark took a last walk by the coffin and sprinkled it with holy water. i was the last one to bless the coffin. As I stood there, one of the soldiers who acted as pallbearer came up to me. “Were you Mark’s math teacher?” he asked. “Mark talked about you a lot, “he said. After the funeral, most of Mark’s former classmates headed to Chuck’s farmhouse for lunch. Mark’s mother and father were there, obviously waiting for me. “We want to show you something,” his father said, taking a wallet out of his pocket. “They found this on Mark when he was killed. We thought you might recognise it.” Opening the billfold, he carefully removed two worn pieces of notebook paper that had obviously been taped, folded, and refolded many times. I knew without looking that the papers were the new on which I had listed all the good things each of Mark’s classmates had said about him. “Thank you so much for doing that,” mark’s mother said. “as you can see, Mark treasured it. “Mark’s classmates started to gather around us. Charlie smiled rather sheepishly and said, “I still have my list. I keep it in the top drawer of my desk at home.” Chuck’s wife said, “Chuck asked me to put his in our wedding album.” “I have mine too,” Marilyn said, “It’s in my diary.” Then Vicki, another classmate, reached into her pocketbook, took out her wallet, and showed her worn and frazzled list to the group. “I carry this with me at all times, “Vicki said without batting an eyelash. “I think we all saved our lists. “That’s when I finally sat down and cried. I cried for Mark and for all his friends who would never see him again. Excerpted from Simple Truths book. The Friday before Easter Day, on which the church commemorates the crucifixion of Jesus. It is a day of fasting and special acts of discipline and selfdenial. The liturgy of the day includes John’s account of the Passion gospel, a solemn form of intercession known as the solemn collects (dating from ancient Rome), and optional devotions before the cross (commonly known as the veneration of the cross). The Eucharist is not celebrated in the Episcopal Church on Good Friday, but Holy Communion may be administered from the reserved sacrament at the Good Friday service. The BCP appoints readings for Morning Prayer and Evening Prayer on Good Friday. Reflection: Do we still need a sacrifice? The feast of Christ’s resurrection. 1) Easter Day is the annual feast of the resurrection, the pascha or Christian Passover, and the eighth day of cosmic creation. Faith in Jesus’ resurrection on the Sunday or third day following his cruciBixion is at the heart of Christian belief. Easter sets the experience of springtime next to the ancient stories of deliverance and the proclamation of the risen Christ. In the west, Easter occurs on the Birst Sunday after the full moon on or after the vernal equinox. Easter always falls between Mar. 22 and Apr. 25 inclusive. Following Jewish custom, the feast begins at sunset on Easter Eve with the Great Vigil of Easter. The Eastern Orthodox Church celebrates Easter on the Birst Sunday after the Jewish pesach or Passover (which follows the spring full moon). Although the two dates sometimes coincide, the eastern date is often one or more weeks later. 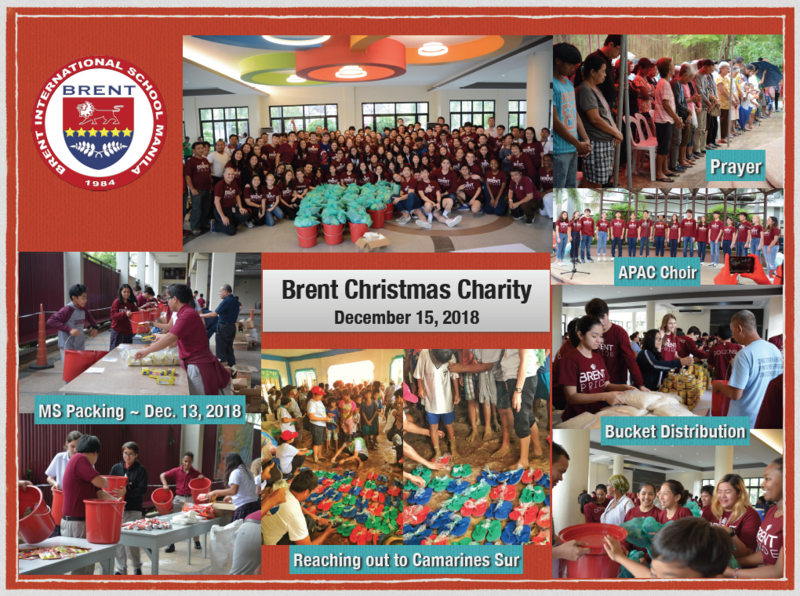 Brent School has, over the years kept a strong Service Learning arm as an important part of its holistic approach to the Brent Educational System. 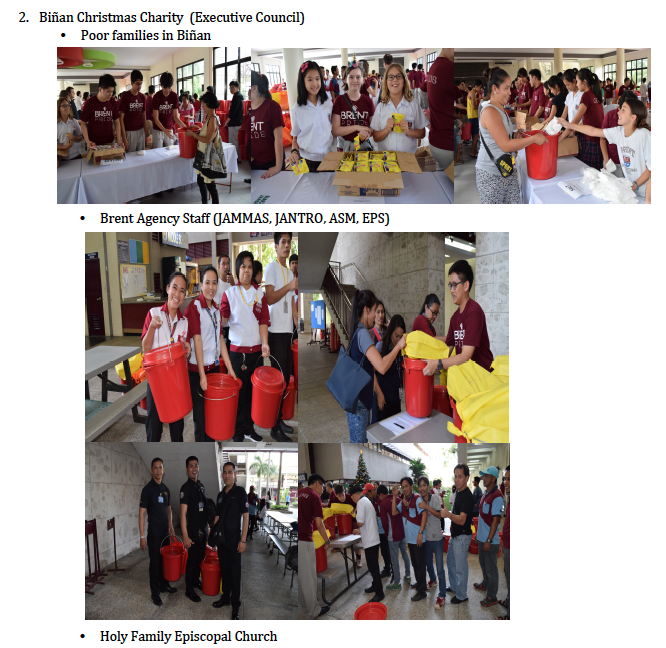 Students, teachers, staff and administrators participate actively in the after school activity by giving of their time and resources in reaching out to those in need. 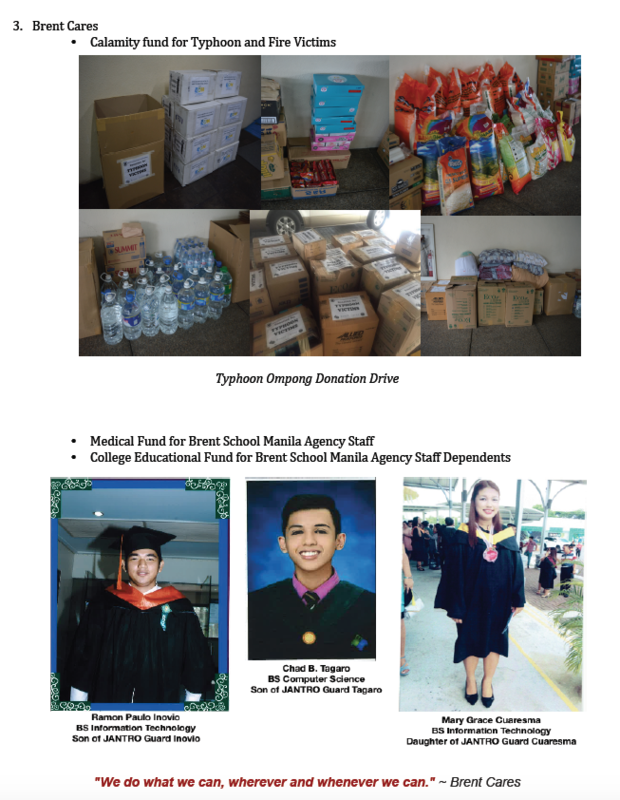 The whole school goes into full support mode when the need arises, especially during the typhoon season. 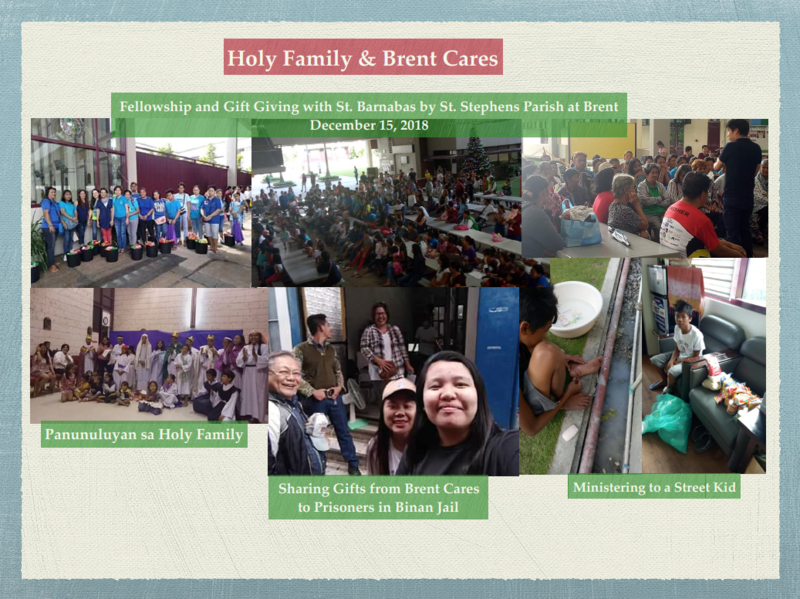 The generous time and preparations that everyone gives to those in need are concrete expressions of the values that Brent stands for. Brent’s Expected School-wide Learning Results touch on the need for self-development, sincerely reaching out to our community certainly develops the minds and hearts of those in our school. Being responsible in all that we do at school and at work reinforces the service-learning element. Indeed, the joy that one receives in giving far surpasses anything that anyone can ever wish for. P. Valley Aims to create one-to-one friendships between students and develop student leaders. Blood Typing Committee Gr. 9 -12 R. Britton Brent students will develop and then maintain a resource data bank for the Brent community’s use as needed. This resource will comprise of contact information, blood types and donation plans of Brent families, faculty and staff. Once composed, the resources can then be used by our committee to locate blood donors for anyone in the Brent community that encounters a medical need. Fr. Jance Brent students to reach out to children in our local community. We will be assisting elementary students from two local elementary schools with their English skills, forming friendships and support our neighbors. •	Philip’s GK Village, Laguna Gr. 9 -12 G. Dubroof A tutoring program for children in a local community on Saturdays. Geek Squad Gr. 9 -12 R. Castañeda Solve computer problems * Refurbish computers and donate to a local classroom * Help organize Tech Week *Produce videos * Develop computer programs * Play computer games * Share your knowledge and skills in I .T. and learn from others as well. K. Regan GIN approaches the 20 largest problems in the world and tries to address them at a local level. Global Issues Network (GIN) is a group focused on solving Earth’s most pressing economical issues. We aim to encourage young people to take initiative to spread awareness for modern global problems such as poverty or improving education in developing countries. Working within a network of “global citizens” creates a platform to develop, share and implement sustainable methods for solving these global issues. Anyone willing to contribute brilliant ideas are welcome. Junior Global Issues Network (GIN) Gr. 3 T. Naude Students will explore the global issues that we face such as shortage of water, climate change, pollution, extinction, disease and much more. Students will learn ways in which they can help the environment, create awareness and to decrease the carbon footprints implanted on earth as time goes by. D. Mapua Aims to provide meaningful concern of and realistic commitment with the less privileged and inculcate deeper understanding and appreciation of ones many talents. D. Michaelsen An environmental advocacy club focused on bringing sustainable solutions to environmental problems in the Philippines. Our projects have focused on recycling, food waste, refilling markers, and environmental field trips. We are looking for students who are dedicated to making the world a better place and are interested in learning about working with local stakeholders to solve local environmental problems. S. Roxas Designed to bring up culture awareness, to create solidarity and compassion for the people in needs. This club helps our students to engage in meaningful service -learning activity with the Holy Family Mission Children with kindness, empathy, and generosity. Project Compassion Gr. 9 -12 R. Rafiñan A service-oriented club that develops a sense of camaraderie, leadership, and character in its members. It aims to help everyone create a better world by spreading awareness and increasing engagement in kind actions. 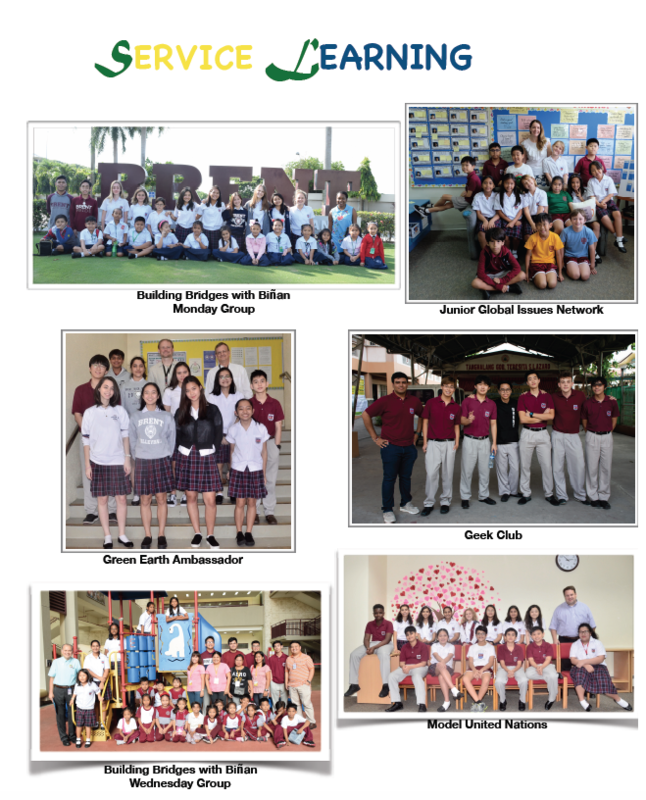 We organize a variety of activities and projects to benefit our school and community. Sunday School Teachers (see below for Sunday School) – Our Sunday School and our VCS (Vacation Church School), under the supervision of Deacon Mary Balitog is run and taught exclusively by the older youth. ECW (Episcopal Church Women) – Early on, the women, the pillars of our church community, organized themselves to form a chapter of the ECW and have since then been the heart of the community . Beyond the traditional ‘women’s’ tasks, which they perform with gusto, ( washing and ironing church linens and vestments, polishing utensils etc)) they are instrumental in organizing most parish social events and run highly successful fund raising activities. They meet every first Sunday of the month under the leadership of their elected officers. This program aims to provide spiritual nourishment to our youngest members through singing, interactive reading and watching appropriate videos.. Average attendance is between 20 and 30 youngsters every Sunday. Some Sunday School ‘alumni’ are now trained Sunday School teacher themselves, while others serve as acolytes and readers. 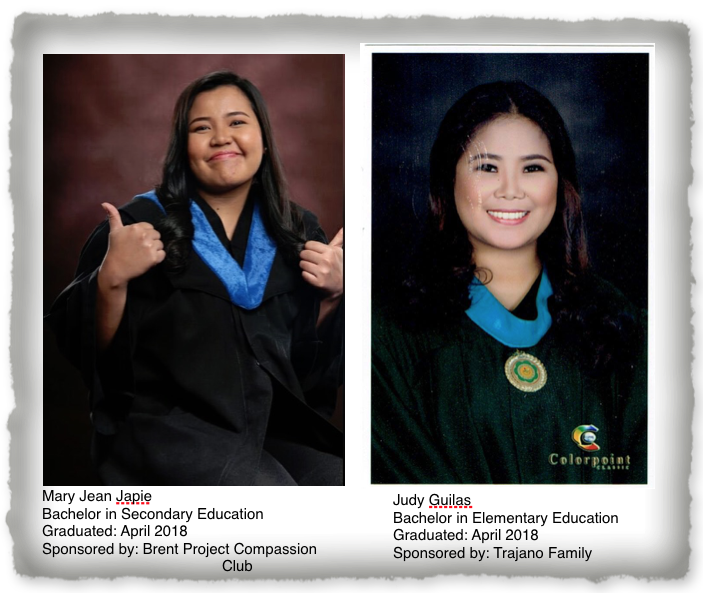 This program, initiated by Brent School’s Project Compassion Club, supported a full time college student who graduated in April, 2017, passed the Licensure examination for teachers and has taught at a Pre- School in Biñan. She plans to get into the Saint Andrew’s Seminary as a Masters in Theology (MTh) student for the school year 2018-2019. Another recipient, graduated last April, 2018. She will be preparing to take the Licensure Examination for teachers. The program funds come from various Brent School clubs and private sources. This program aims to support any student from a low-income family who is an active member of the parish and desires to pursue a College Degree. Support is given in the form of interest free loans to be repaid once the student has graduated and gainfully employed. The first student on this program will begin third-year studies this year. This program also aims to be able to provide cash for emergency purposes without any obligation from the recipient. This fund is taken from the fourth Sunday offering as well as private sources. Requests for help are evaluated by the vestry. In 2015, the Pitong Gatang settlement from which most of our original members came was relocated in Langkiwa, a good 30 minute walk from Brent Chapel. Some children still show up for Sunday School on Sunday mornings along with some adults. For those who can’t find the time, Deacon Mary Balitog visits regularly with the Celebration of Word and Communion one Sunday a month. Timbao, where some of our members reside, is located at some distance from Brent School. For those who find it hard to get to us on Sundays, Deacon Mary Balitog visits once a month to conduct a Celebration of Word and Communion. In 2012 Deacon Jonathan Britt and his wife Grace opened a preaching station on their property in Cavinti, Laguna. Before long a small but regular congregation was formed which meets twice a month. Deacon Jonathan conducts a Celebration of Word and Communion first Sundays, and Fr. Joe Mock celebrates the Eucharist on the third. 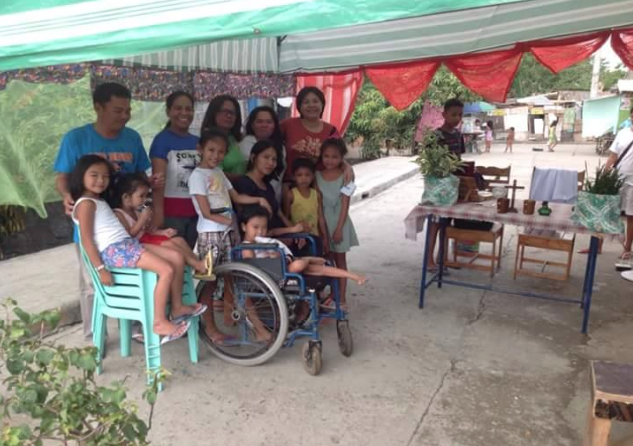 A contingent of Holy Family members lead by Deacon Mary and Mrs. Grace Britt had been going to Tubili in Mindoro with the permission of the Dean of the Southern Tagalog Deanery and the Priest-In-Charge of an existing church in the area to start a mission with the Mangyan Tribe of Mindoro. This mission was initiated in 2016. The Holy Spirit is using the Holy Family Episcopal Church through Deacon Mary by sending children in need of help her way. Out of the blue, somebody calls Dcn. Mary about a kid in need, and there she is to help. Isn’t that amazing work of the Holy Spirit? Recently we had an intern from the US who stayed with the Parish for a month and assisted the Deacon with the programs of the Parish. She experienced the day to day living in a less privileged area in the Philippines that is different from where she grew up. She helped in the Sunday school and some youth activities. With her is another intern from our local school who also helped in the parish works while they are here with the supervision of Deacon Mary.